Rae Lyall has been chosen by the Goddess to be the first female Guardian which pisses off a lot of elder shifters. They claim her choosing was engineered by her father, the leader of the Montana shifter town. Wanting to keep her safe he travels with her to Alaska and leaves her with Zander, in the hopes Zander will protect her, but also train her to use her gifts. If you have read the last several books in this series, then you are familiar with Zander. He is Goddess blessed, using his gifts to heal. He is also considered to be a slightly crazy polar bear shifter who is a bit anti social. He does not appreciate this young woman being his responsibility, but her loneliness and fear of being an outcaste tugs on his heart. The last few books in this series have lacked the fun and originality that were in the first few books. Zander brings back that joy and fun, living life for the moment, determined that even if he’s in the middle of a cluster@*#^, things usually turn out alright. Rae who has been sheltered in a shifter town, doesn’t know what hits her when life turns upside down, and their adventures begin. 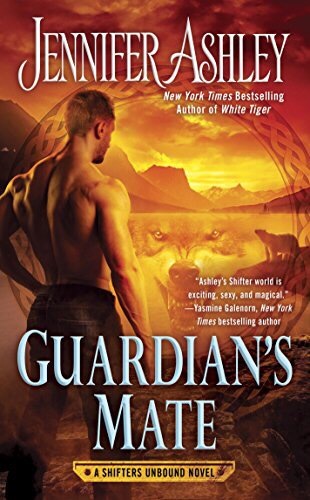 Guardian’s Mate has brought the fun back into this series with Zander and Rae’s story. His guidance is somewhat unorthodox, but it seems to be exactly what she needs to gain confidence and prove to everyone that she was the right choice as Guardian. If the author continues to have fun with this series then I will keep reading her stories. After all, these books are not serious, they are romances between people who turn into animals. That should be fun!